Getting a good night's sleep may not actually be very good for you after all. A new study has found that people who sleep more than eight hours or less than four hours a night face a higher risk of dying from heart disease. Researchers from the Norwegian University of Science and Technology collected information from 400,000 Taiwanese adults, aged 20 years and older, who had medical check-ups between 1994 and 2011. 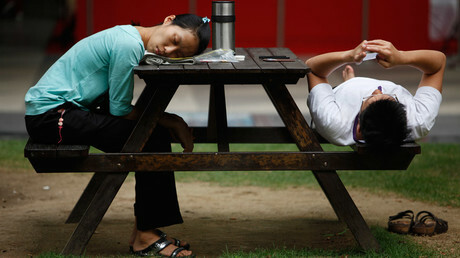 The participants were asked how long they slept each night, from zero to more than eight hours. In a follow-up, 711 of the volunteers had died from cardiovascular disease, leading the researchers to conclude that those who reported sleeping eight hours or more were 35 percent more likely to die from the disease, compared to those who slept six to eight hours a night. Those who slept less than four hours were 34 percent more likely die from the condition. “We don’t know which mechanism can explain a direct causal link between long sleep duration and an increased risk of dying from coronary heart disease,” lead author Dr. Linn Beate Strand said in a statement. The results also showed that women in both groups were more at risk of heart disease than men. “Women are more prone to sleep problems than men, and previous studies have also shown that women who sleep a little or a lot may be at increased risk for cardiovascular disease,” Strand said. “Our results show that enough, but not too much sleep, is important for a healthy lifestyle,” he added. Strand and his colleagues concluded that adequate sleep should be considered part of a healthy lifestyle and stressed that further studies are needed to better understand the underlying mechanisms associated with sleep and heart disease. The study was published in the March 2016 issue of the Cardiology journal.